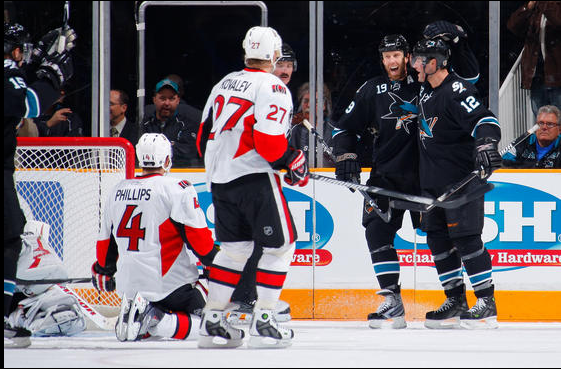 Quite the fun game tonight as the Sharks defeated the Ottawa Senators 5-2. Dany Heatley played his former team for the first time, as did Milan Michalek and Jonathan Cheechoo. Things were very spirited in the first period. Those three players definitely tried to make statements to their former clubs, and one was very successful. Michalek netted two goals, so as far as I’m concerned, only Sharks scored tonight. He looked like a man on a mission to score. He pushed the Sens’ play and forecheck, constantly battled in front of the net. What else can I say? Milan deserved it. Buuuttt, the Sharks are too good. A fourth man entered the ring to prove something; Patrick Marleau played his 900th game, all with the Sharks, and showed everyone it was a good decision to not trade him after all these years. He scored two goals as well and almost had a third, but lost the puck on a cut-in towards the net. It was just a fun game to watch. There wasn’t a shortage of effort, maybe lack of intelligence (I think of one player to be named later), but all the players tried hard. Frazer McLaren dropped the gloves with Matt Carkner in the first to continue the entertainment. Unfortunately, McLaren dropped another decision. It was close after Carkner ended the fight on purpose by dragging Frazer down, but Carkner had more punches land. Frazer needs to start winning some fights soon and not continue this Jody Shelley syndrome. Both the second and third periods started off considerably slower than the first period; however, things picked up about halfway through each time. Ryane Clowe came through with a goal after a tough battle between Manny Malhotra and Sens defenders. My tune is slowly starting to change on Manny. He scored an empty netter tonight and has shown some good speed and toughness lately. But I’m not so quick to change my mind on people. Hopefully this stays consistent. Thomas Greiss manned the net for the Sharks. He hadn’t started in two weeks so coach Todd McClellan gave Evgeni Nabokov the night off. “Jesus” Greiss sure likes to flail. Reminds me of Magikarp from Pokemon. Both Greiss and Magikarp have one move: Flail. Obviously Greiss is more effective at it. He made some spectacular saves to preserve the lead. This backup situation could get juicy next season. After the Sharks decide whether or not to resign Nabby, will they put all their stock in Greiss as the heir apparent? Or will they look further to stud prospects Alex Stalock and Tyson Sexsmith? Who knows, but that’s getting a little ahead of myself. The Sharks’ top line of Heatley-Thornton-Marleau amassed six points tonight continuing their William-Sherman-March-to-the-Sea trek torching any team in their path. This guy took three penalties in the third period alone. What in the world was he thinking? Maybe he was excited because his grandfather was watching him play for the first time since he was in college. I don’t know, but regardless, this is the kind of thing that gets you in the coach’s doghouse. I mean, almost half of the period was shorthanded because of Murray. Use your friggin’ head, son. Boy has Cheech ever fallen off the radar. He’s a third-liner in Ottawa and has been reduced to scrubbing the poop deck every game. Long gone are the days of him scoring 50 goals. Poor Cheech. Guess you really find out how good Joe Thornton is when the sniper leaves Jumbo’s side. Hit-O-Meter: SJ 21 OTT 18; Scott Nichol (4) and Devin Setoguchi (3) led the team. Seto and Torrey Mitchell aren’t getting much important action on the fourth line. Torrey received an extra minute compared to last game and Seto’s ice time was decreased. I wonder how much rust these two actually accumulated, because I think we all know these guys are much better than fourth liners. Patience is a virtue I guess. Can’t wait to see them fully recovered. The Sharks play St. Louis on Thursday.